Patty Wysong has created a fun meme where once a week bloggers posted on a letter of the alphabet. Check out the details here. It is called A2Z: Take 2. A2Z as she challenges bloggers to write a post each week going through the alphabet. Take 2 since this is the second time she has used this meme. Anyone can join in and you don’t have to always participate. What does the letter A bring to my mind and heart? I knew the answer immediately: my great Aunt Anna. What a legacy she left. My middle name – Anne – was given to me in her honor. But she is also deep within my genes and DNA as she was a writer and studied spiritual giants in her lifetime. Aunt Anna was born on January 24 1883 and was the sister of my grandfather. She died when I was just a teenager at the age of 84 so my memory of her is a gray-headed old woman who liked to tend her garden. Little did I know then that as an adult, I would identify so much with her. Oh, how I would love to spend time with her now and talk over our mutual interests. Aunt Annie received her Doctorate in Theology from Columbia University, New York in 1934. Her dissertation and first published book was called Friends of God – Practical Mystics of the 14th Century. She also published a book, St. Elizabeth – Her Brother’s Keeper and numerous articles. I have a copy of her third unpublished book too. Anna spent a year in Germany researching the German mysticsof the middle ages: Meister Eckhart, John Tauler, Heinrich Suso, and Jan Ruysbroeck. Aunt Anna – spirituality and “ the great cloud of witnesses” that go before us. Besides teaching, Aunt Anna worked for the National Board of the YWCA and represented them in outreach to China and Japan. She did research in China for the Layman’s Foreign Missions and then served as Executive Secretary of the Council of Women Home Mission and Director of American Indian Work. She traveled extensively throughout the world. She knew so many people personally in Japan and China that when wars broke out in 1940s, she traveled on peace missions and took a stand against the war – a courageous and unpopular position. The violence and deaths broke her heart as she lost friends on all sides. And she wrote in her journals. 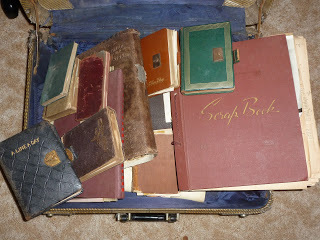 I am so blessed to have most of her diaries, starting in 1913 through the 1950s. A few years are missing and many of the entries are just daily living references but also many treasures lie within her words waiting for me to discover. On of my goals this year is to read through all her journals and get to know my Aunt Anna better. Legacy – A legacy is something that is handed down from one generation to another. Not only did Aunt Anna pass on physical items – her journals, letters, photographs – but she bequeathed something much deeper to me – her namesake. Her words and her life unite us across generations and the hallowed space between heaven and earth. What does the letter A bring to my mind and heart? – My Aunt Anna and her priceless spiritual legacy woven into my soul. The letter of the alphabet flooded me with cherished memories and thoughts about legacy. How about you? What does leaving a legacy mean to you?